When it's too cold to make steaks on the grill, you can use your gas oven to broil the meat. 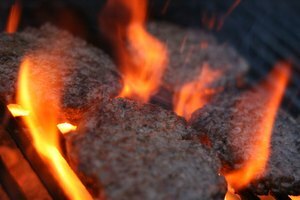 Broilers work nearly the same way as grills, but food is placed beneath the flame rather than above it. Not all broilers function the same way. Gas stoves remain closed while cooking, but broilers must be kept slightly open to prevent overheating, and may fill a kitchen with smoke. Use a gas oven to prepare steak almost like you would on an outdoor grill. Set the oven temperature to "broil." Allow the broiler to preheat for five minutes. Open the broiler compartment--a fold-down door located under the oven. Place your broiling pan into the preheated broiler compartment and close. Allow the pan to heat for five minutes. Lightly brush your steak with olive oil. This will keep the steak from sticking to the broiling pan. Do not soak your steak in oil, or it will burn. Remove the broiling pan from the broiler and gently place your steak on the pan. Position the broiling pan by sliding the pan's edges securely into the rack notches inside the broiler. The steak will heat faster the closer it is to the heat; use the top rack notches for rare to medium steak, or the bottom notches for medium-well to well-done. Broil steak on one side for eight minutes. 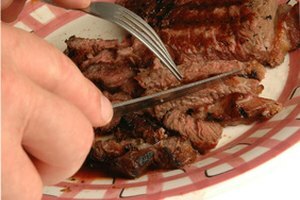 Flip the steak with tongs and broil for another eight minutes. Make sure the steak is dark brown on top; if not, return to the broiler for no more than two minutes. Remove the steak from the broiler pan. Add salt and pepper to taste, and place the steak on a cutting board for ten minutes. This allows the steak's juices to redistribute; cutting the meat too soon will cause the steak's moisture and flavor to leak onto the cutting board, resulting in dry-tasting steak. Top sirloin, rib eye, beef tenderloin and T-bone steaks work best for broiling because they contain more fat and aren't as likely to become dry.